Take our Scary Halloween Survey - Win Prizes! You have seen our list of the Top Halloween Costumes, now tell us which ones are your favorite costumes for this Halloween! The 6th Annual Extreme Halloween List of the Top Halloween Costumes is Out! Each year Extreme Halloween features their picks for the most popular and favorite Halloween costumes in all categories. The Top Halloween Costume List for 2009 is now published and available at ExtremeHalloween.com. Did you favorites make the list? We always invite you to tell us what your favorite costumes are too! Take our 2009 Scary Halloween Survey! Its quick and fun and you can win prizes in our weekly prize drawings! My blogger friend over at the MomStart.com blog is running a super cool giveaway! Head over to the MomStart blog and see how you can enter to win your choice of matching Mommy & Child costumes from us at Annies Costumes. Free costumes are very cool, but 2 free matching costumes are even better! 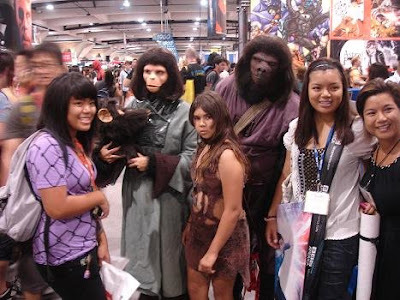 It's Time for Comic Con - Do You Know Where Your Favorite Costumes Are? 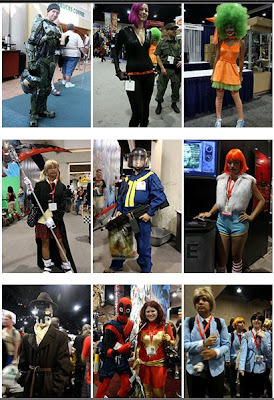 Every year for Comic Con is San Diego, I am always on the watch for all the great costume ideas and trends that emerge from this ever - growing convention. What started out as a comic book affair has now turned into a star clad, movie star fiesta and a complete phenomenon in itself! I have scoured the web for you to find some of the best, weirdest and most fun Comic-Con costume creations! According to MTV's Splash Page on Comic Con Costumes, "Rorschach and Wolverine were the most frequent costumes seen around the show floor, there were also a good share of video game and anime characters, as well as movie characters and, of course, the requisite amount of comic book heroes and villains." Check out their Comic Con Costume Gallery! 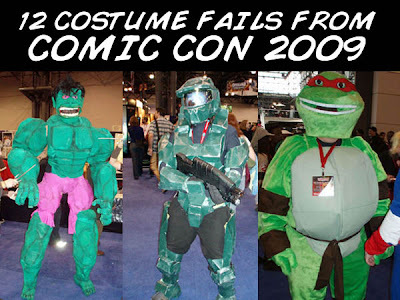 12 Costume Fails from Comic Con - this one is hilarious! You've gotta check it out! Did you know? This year was Comic Con's 35th Annual Masquerade contest!